Continued progress in drug discovery and development is increasing the potential number of injectable drugs. As a result, pharmaceutical companies are collaborating with drug delivery firms to address patients’ concerns and needs, and to maximize revenues. Management Forum’s recent “Injectable Drug Delivery” conference provided insight on how companies are improving device design and, subsequently, delivery. According to Matthew Young, founder and CEO at Oval Medical Technologies, needle-free injectors were fashionable ten years ago but still had some disadvantages—they were not always painless, the high forces required to drive a drug into tissues made them expensive, and extra steps were often required to fill and use them compared to disposable autoinjectors. In addition, many biological drugs could be damaged by a device’s high-shear forces. Working for a design consultancy agency specializing in delivery devices, Young found that many problems with autoinjectors start with the primary drug container. The syringes can contain various contaminants (silicone, tungsten, rubber), which can negatively affect biological drugs. The containers are fragile, and needle safety is a concern due to the rubber needle cover that must be manually removed before injection and the variable and high forces required to move the plunger. Oval has filed four patent applications, and its new technology platform provides a range of benefits to contain and deliver injectable drugs, Young said. Advantages include: reduced potential for contamination, ease of use, less painful, and less expensive, he reported, adding that the technology can accommodate more viscous drugs with various needle lengths for subcutaneous, IM, and IV bolus delivery, with volumes ranging from 0.1 mL to 2.0 mL. Glide Pharma’s Glide SDI® Solid Dose Injector incorporates a solid drug formulation smaller than a grain of rice that is pushed under the skin, reported Charles Potter, Ph.D., CEO. “One of the challenges is making sure the dosage is sufficiently robust so it will penetrate the skin,” he added. This property is achieved by mixing the drug with excipients for the required release kinetics. A quick-dissolving formulation uses a sugar and a controlled-release version uses a polymer. The drug is pushed via a spring-powered, re-usable actuator, which is about the size of a fountain pen. “When the user stops pushing, the drug stops moving, meaning we’re delivering it to the same depth every time. That’s very important to our technology,” Dr. Potter said. Although the drugs have to be re-formulated, the solid dose provides better storage, safety, stability, easy transportation, accurate dosing, minimal skin response, and is cost-effective, he added. 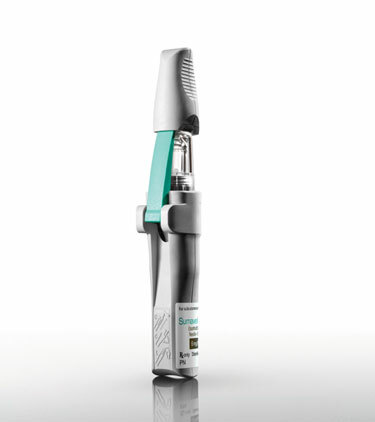 The Solid Dose Injector is currently being evaluated in several clinical studies. A Phase I trial has been completed involving a fentanyl product for acute pain, and another one is starting using a Novartis drug to reduce human growth hormone levels. Another big application area is vaccines. The company has participated in five preclinical vaccine studies with three different antigens, Dr. Potter said. Sumavel™ DosePro™ is an FDA-approved prefilled, single-use, needle-free, disposable injection system for treatment of migraines and cluster headaches, according to Stephen Farr, Ph.D., president and COO at Zogenix. One of the key goals in designing Sumavel was obtaining the best pressure profile for selective subcutaneous administration. Dr. Farr said this is characterized by relatively high pressure (driven by nitrogen gas) for a fraction of the injection time, no more than a millisecond. This is enough time to penetrate the skin. 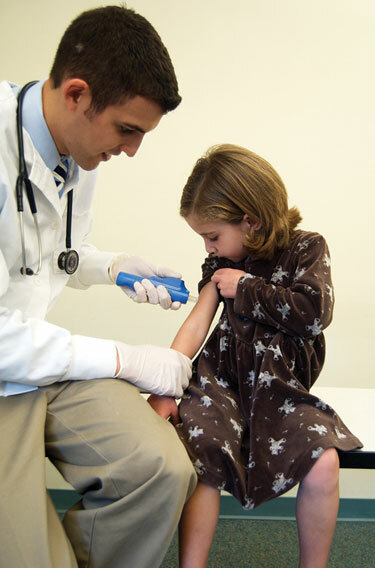 Three single-dose early-phase studies using DosePro in human pilot studies are ongoing. The company is waiting for proof-of-concept data before it announces what drugs are being evaluated. Preclinical work with mAbs has shown that the device has no effect on drug integrity nor any enhanced immunogenicity, Dr. Farr said. The device currently delivers from 0.5 mL down to 0.15 mL, and a second-generation unit will offer increased volume up to 1.0 mL, he added. Sumavel DosePro is a new drug-device combination from Zogenix that subcutaneously delivers sumatriptan using the firm’s needle-free drug delivery system. The product is indicated for the acute treatment of migraine, with or without aura, and for the acute treatment of cluster headache episodes. PharmaJet, a spring-powered, needle-free device, offers several advantages over traditional needle syringes, according to Cathy Callender, founder of PharmaJet. “The major problem with needles, of course, is the potential for ‘sharps’ injury and blood/tissue contamination. “We did a survey across the U.S. and it costs an average of $0.25 to throw away a needle. Our technology does not have to go into a sharp box.” Furthermore, the injector part of the device can be disinfected and cleaned using standard medical cleaning solutions. The injector is made of polypropylene, which is less expensive than the polycarbonate used by most needle-free manufacturers. There are four components to PharmaJet—the syringe and filling adaptor are disposable; the two injectors (designed for different tissue densities) are reusable. The Light injector is for lighter tissue density (older patients, infants), and the Heavy injector is for adults and children. Both injectors can deliver either IM or subcutaneous injections. Pinching the tissue allows for subcutaneous delivery; placing the device flat against the skin allows for IM delivery. The device received FDA clearance about a year ago for delivery of 0.5 mL of any injectable. “We can use any vaccine, and it doesn’t have to be re-formulated. Some other devices require re-formulation, which can be expensive and time-consuming,” explained Callender. Currently, the device is being sold for use with influenza seasonal vaccine and the H1N1 vaccine. The company has two new products in development: a 0.1 mL device for delivery in the upper 2 mm layer of skin to generate the best immune system reaction, and a variable volume device with the ability to deliver between 0.1 mL and 1.0 mL. PharmaJet’s needle-free system delivers liquid medications at high speed, creating a “liquid jet” that penetrates the skin and delivers the medicine through the skin in less than 1/3 of a second, according to the company. Some of the challenges in delivering new biotech drugs revolve around the fact that many are proteins, which are sensitive to silicone, metal particles like tungsten, and often viscous. In addition, many require refrigeration and/or freezing, which increases storage and packaging costs. “The big trend now is moving from re-usable devices to disposable devices. Disposables are easier to use and provide better compliance,” explained Joel Cotten, European product manager at BD Medical Pharmaceutical Systems. He added that needle-free devices have not replaced needles because they lack a standardized primary container and tend to be expensive. Also, since needles are already very thin, there is no benefit to needle-free devices regarding pain. Many factors influence the success of new delivery devices, understanding patients’ needs is a critical factor. “It’s important to understand the difference between new patients and expert patients. An aging patient with a chronic condition prefers a device with a hidden needle. Yet, an expert patient isn’t afraid of needles and wants a very thin needle that can be checked before injection,” Cotton said. BD is developing several new devices compatible with biotech drugs. The BD PhysioJect™, which delivers between 0.2 mL and 1.0 mL, is a disposable auto-injector developed for chronic disease. The BD MicroInfuser™ will automatically deliver viscous drugs, with volumes between 1.0 mL up to 5 or 6 mL, Cotton said. The third product is pen injectors using cartridges with larger gauge needles.